Several inspiring research staff were honoured at The Ottawa Hospital’s Excellence Awards ceremony on May 22. The Ottawa Stroke Program received the Research Excellence Team Award and Amy Geertsma received the Inspire Award for Outstanding Clinical Research Staff Member. This team of physicians, nurses, speech-language pathologists, physiotherapists, educators, social workers and trainees has cultivated a world-class research program. They played a lead role in establishing endovascular treatment as a breakthrough for stroke, which has reduced the death rate by 50 percent in eligible patients. Their research is also improving how we diagnose and treat conditions such as intracerebral hemorrhage and transient ischemic attack. 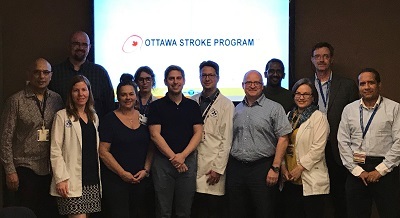 The stroke group also led an innovative project to reorganize clinical care at The Ottawa Hospital and improve flow for patients with neurological diseases. Their work on stroke prevention has also had a huge impact, contributing to a 19% decrease in stroke rates in the Champlain region over the last 10 years. They are also investigating new technologies to improve rehabilitation, including computer tablets, web platforms and tele-rehabilitation. Team members: Dar Dowlatshahi, Grant Stotts, Karen Mallet, Marianne Thornton, Sophia Gocan, Aline Bourgoin, Michel Shamy, Vignan Yogendrakumar, Rany Shamloul, Sohail Robert, Michael Pugliese, Joanne Lambley, Moira Teed, Tracey Dyks. 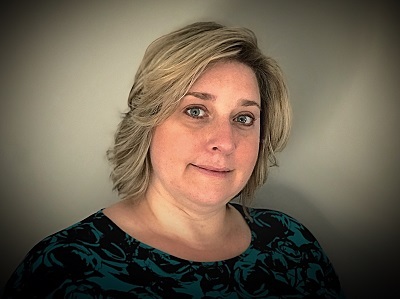 As Manager of The Ottawa Health Science Network Research Ethics Board, Amy consistently inspires her team to provide efficient service to researchers who study ways to improve treatment and care. Amy is dedicated and committed, and has a positive attitude towards all challenges. Amy inspires her staff to approach their challenges the same way and takes the time to help others understand any issue at hand. She is always open to suggestions and leads by example with respectful and open communication. Amy has a terrific thirst for knowledge and she encourages ongoing education for her entire team. She trains and encourages members of the Research Ethics Board and the administrative staff to keep regulatory compliance at the forefront of processes and decisions. In addition, Drs. Ruth Padmore, Anne Lui and Dante Pascali all received the Physician Clinician Recognition Award, Dr. Grant Stotts received the Physician Leadership Award. Paul Beaulé, Andrew Speirs, Sasha Carsen, Hanspeter Frei, Gerd Melkus, Kawan Rakhra, Mario Lamontagne, K.C. Geoffrey Ng, George Grammatopoulos. Kumanan Wilson, Katherine Atkinson, Cameron Bell, Ruth Rennicks White, Julien Guerinet, Yulric Sequeira, Malia Murphy, Michelle Paradis, Ashley Foster, Andrew Faulkner, Marlene Elliott, Lindsay Wilson, Jordan Gignac, Kim Barnhardt, Christina Muxlow, Domenic Richici, Andrew Rogers.